In case you are new around here this is where the Admin (me) chooses one excel­lent photo nom­i­nated by other mem­bers from the Member’s monthly choice forum. Once 10 images are nom­i­nated, I choose a ‘winner’. Just so it’s clear, the photo I choose are not nec­es­sar­ily the best ones of the month. I’ve come to real­ize it’s not log­i­cal to pit images from totally dif­fer­ent gen­res against each other. That’s why there are cat­e­gories in photo con­tests. My goal is to sim­ply choose an excel­lent photo and talk about why I think it rocks. 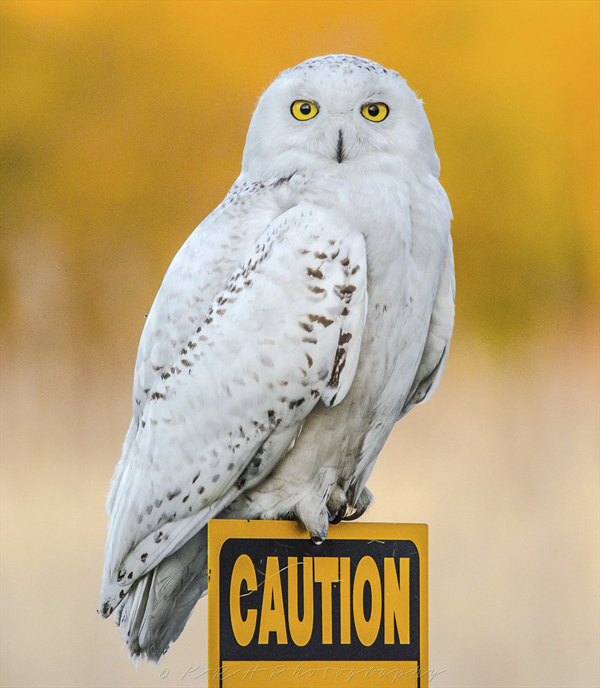 1 — Colour/exposure — The colour here was well seen with the yel­low sign match­ing the owl’s yel­low eyes and blend­ing into the yel­lowy back­ground. Expo­sure is well han­dled with lovely non-clipped white tones. 2 — Sharpness/aperture — The eyes look razor sharp as they should be and I really like the super-shallow depth of field that sep­a­rates the owl from the back­ground. 3 — Framing/composition — Unlike many com­po­si­tions that include words that become a dis­trac­tion, here the word ‘cau­tion’ on the sign com­pli­ments this com­po­si­tion big time. We see the owl’s direct intense stare as well as its sharp claws and we should indeed take cau­tion. I very much like the scratch marks on the sign that may well have been the result of those sharp claws. For all these rea­sons, this is my choice for this round. Since we all have opin­ions, some mem­bers may dis­agree with my choice. That’s cool but THIS thread is not the place for debate over my pick, NOR is it the place to fur­ther cri­tique the image. The pur­pose here is to sug­gest strong ele­ments in the photo that we may learn from. So, we spent May in Paris. Didn’t want to leave the 5th Fl of Musee D’Orsay. Think Met has bet­ter Manets, though. Over­whelmed by L’Orangerie. Photo show was over­looked by many. Photo museum had a Bel­gian pho­tog­ra­pher who printed big. Lots to see. My wife and I go to muse­ums, all kinds. Last year, we went to the Her­mitage. Need a month or a year for that place. I always look at the painted images like they were pho­tographs. Sculp­ture chal­lenges me the most, because of its three dimen­sional quality. But my favorite things to look at are por­traits. And, you can­not do bet­ter, right now, than the Met and the John Singer Sar­gent show. I only have so many shots left.